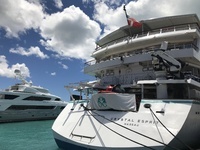 This new vessel for Crystal was completely refitted in 2015 and christened in December 2015 after it’s previous life as a private yacht for the Chairman of the parent company of Crystal. This is a big departure from the two older Ocean ships the Serenity and the Symphony that I have sailed five times and loved. This beautiful yacht has 31 cabins (including one Owners Suite which is 515 square feet). Most of the suites (S1,2 and 3) are 280 SF which is huge for a yacht (and larger than the non-suite cabins on the Crystal ocean ships and much larger then the 195 SF cabins on the competitor Sea Dream Yacht Club. They are all ocean view (this is a yacht after all). The cabins are decorated in muted greys and taupe with a relaxed feel. 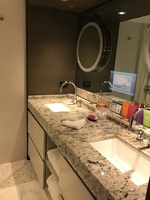 They all have King beds with great bedding and all the modern touches travelers today demand with plenty of outlets, USB ports and a great iPad by the bed to set alarms, wake up calls, see the daily schedule and more! There is so much storage we couldn’t fill it all and we are not light packers. There is a full length closet with the famous 2 sets of Crystal robes (the heavy terry I don’t like and the lovely kimono style). There is a another closet with short hanging and more drawers. The bathroom is amazing with a huge shower, tons of storage, double sinks, large mirror and a TV embedded in the mirror. There are large size luxury Italian Etro amenities. A stocked mini-bar is included and there is a Nespresso machine. Because we arrived on Easter Sunday, we had a table full of beautiful Easter chocolates and our darling (two) stewards greeted us with bunny ears! There are also great features like the lighting system with a switch for floor lighting for night bathroom visits and a choice of lighting from bright to relaxing! The owners suite also has a Japanese toilet with heated seat and more and a beautiful bathtub. The yacht holds only 62 passengers (or up to 65 max if there are 3 third berth passengers. On our sailing we had only 43 (with one very well behaved 12 year old girl). Our crew was 89 and pampering and extra special service is an understatement. I’ve sailed many luxury lines and stayed in luxury properties but the service level on the Crystal Esprit was exceptional. 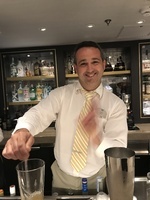 Part of that was the staff to guest ratio and part was the hand picked crew who seemed to truly love being part of the Esprit experience and went above and beyond. There are multiple dining spots onboard from the Yacht Club restaurant with award winning chef Adam Jenskins to 24 hour room service which we never tried. (actually that is not true as the night they were having caviar in the Cove before dinner we knew we wouldn’t make it in time, and expressed our “dismay” to our butler in the all – he brought us our own caviar set up and popped our champagne for us). The Patio Café for lunch and breakfast is lovely (and delicious) and the Grill on deck 5 for outdoor dining is great with a small but fun selection from Kobe burgers to Frito Misto that we had several times. The Pantry on Deck 2 is a great self-service bistro with light snacks, bakery goods and little jars that change daily with fun salads, hummus and more (plus an easy 24 hour specialty coffee machine). This is truly an all-inclusive experience with all gourmet meals, beverages (a great wine list included), butler service and choice of several excursions in each port from easy to strenuous. Also included are the water sports like kayaks, paddle boards, jet skis and the fun speed boat. 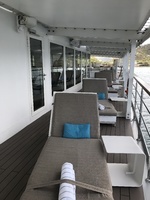 We weren’t sure what the demographics might be on this yacht as it is a departure from the Crystal ocean ships and more luxury than the competitor SeaDream Yacht Club. We really had a great group of guests ranging from the late 30s to the 70s and all well-traveled, interesting and friendly. We sailed in the West Indies round trip Marigot. St. Martin was very badly hit by the 2017 hurricane so the port and the island has really suffered. But all of our port stops were great (Moskito Island, Saba, St. Barts, Antigua, St. Kitts and Nevis. There are several choices of complimentary excursions in most port from relaxing to strenuous hikes. My husband wasn’t able to do any of the strenuous ones but I heard great things about them. The first port is an beach BBQ on Moskito island (one of Richard Branson’s private islands) and a great way to start the cruise. Was it as fun as my time on SeaDream Yacht Club with a girlfriend? Maybe not. Was it more luxurious ….for sure! Were there lots of special touches that made it so special. YES! As me about them. Would I do it again or recommend to clients – absolutely! 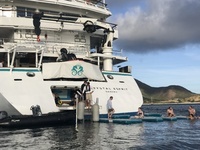 This new vessel for Crystal was completely refitted in 2015 and christened in December 2015 after it’s previous life as a private yacht for the Chairman of the parent company of Crystal. This is a big departure from the two older Ocean ships the Serenity and the Symphony that I have sailed five times and loved. This beautiful yacht has 31 cabins (including one Owners Suite which is 515 square feet). 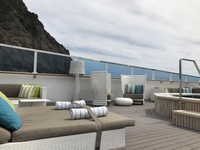 Most of the suites (S1,2 and 3) are 280 SF which is huge for a yacht (and larger than the non-suite cabins on the Crystal ocean ships and much larger then the 195 SF cabins on the competitor Sea Dream Yacht Club. They are all ocean view (this is a yacht after all). The cabins are decorated in muted greys and taupe with a relaxed feel. 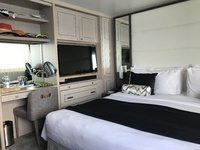 They all have King beds with great bedding and all the modern touches travelers today demand with plenty of outlets, USB ports and a great iPad by the bed to set alarms, wake up calls, see the daily schedule and more! There is so much storage we couldn’t fill it all and we are not light packers. There is a full length closet with the famous 2 sets of Crystal robes (the heavy terry I don’t like and the lovely kimono style). There is a another closet with short hanging and more drawers. The bathroom is amazing with a huge shower, tons of storage, double sinks, large mirror and a TV embedded in the mirror. There are large size luxury Italian Etro amenities. A stocked mini-bar is included and there is a Nespresso machine. Because we arrived on Easter Sunday, we had a table full of beautiful Easter chocolates and our darling (two) stewards greeted us with bunny ears! There are also great features like the lighting system with a switch for floor lighting for night bathroom visits and a choice of lighting from bright to relaxing! The owners suite also has a Japanese toilet with heated seat and more and a beautiful bathtub. The yacht holds only 62 passengers (or up to 65 max if there are 3 third berth passengers. On our sailing we had only 43 (with one very well behaved 12 year old girl). Our crew was 89 and pampering and extra special service is an understatement. I’ve sailed many luxury lines and stayed in luxury properties but the service level on the Crystal Esprit was exceptional. Part of that was the staff to guest ratio and part was the hand picked crew who seemed to truly love being part of the Esprit experience and went above and beyond. There are multiple dining spots onboard from the Yacht Club restaurant with award winning chef Adam Jenskins to 24 hour room service which we never tried. (actually that is not true as the night they were having caviar in the Cove before dinner we knew we wouldn’t make it in time, and expressed our “dismay” to our butler in the all – he brought us our own caviar set up and popped our champagne for us). The Patio Café for lunch and breakfast is lovely (and delicious) and the Grill on deck 5 for outdoor dining is great with a small but fun selection from Kobe burgers to Frito Misto that we had several times. The Pantry on Deck 2 is a great self-service bistro with light snacks, bakery goods and little jars that change daily with fun salads, hummus and more (plus an easy 24 hour specialty coffee machine). 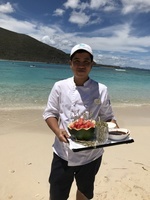 This is truly an all-inclusive experience with all gourmet meals, beverages (a great wine list included), butler service and choice of several excursions in each port from easy to strenuous. Also included are the water sports like kayaks, paddle boards, jet skis and the fun speed boat. We weren’t sure what the demographics might be on this yacht as it is a departure from the Crystal ocean ships and more luxury than the competitor SeaDream Yacht Club. We really had a great group of guests ranging from the late 30s to the 70s and all well-traveled, interesting and friendly. We sailed in the West Indies round trip Marigot. St. Martin was very badly hit by the 2017 hurricane so the port and the island has really suffered. But all of our port stops were great (Moskito Island, Saba, St. Barts, Antigua, St. Kitts and Nevis. There are several choices of complimentary excursions in most port from relaxing to strenuous hikes. My husband wasn’t able to do any of the strenuous ones but I heard great things about them. The first port is an beach BBQ on Moskito island (one of Richard Branson’s private islands) and a great way to start the cruise. Was it as fun as my time on SeaDream Yacht Club with a girlfriend? Maybe not. Was it more luxurious ….for sure! Were there lots of special touches that made it so special. YES! As me about them. Would I do it again or recommend to clients – absolutely! Fabulous! See review. Loved the bathroom and all the technology!